Black Panther is probably the most hyped film of the past few years—and definitely of 2018. Already it's set to have the biggest February box office opening of any movie—ever. lt's also sold more advance tickets than any other Marvel film, and is on track to earn $165 million during its three-day release. But beyond the numbers, the film is hugely anticipated because of its cultural significance. It's not only the blackest Marvel film ever made– it's the biggest film about a black super hero ever. A super hero who hails directly from Africa, no less. In a super hero world that has largely been white and male, that's a huge deal. The premiere of the movie was an entire event. 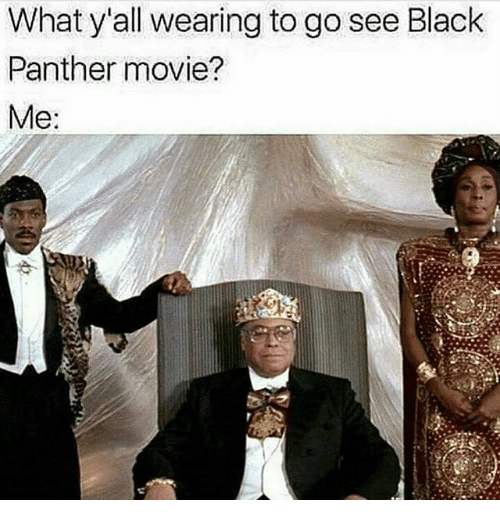 And if you and your crew plan to show up to the movie dressed like a resident of Zamunda, you definitely aren't alone. Fair or not, Black Panther isn't just another movie. It's a cultural moment that could turn into a cinematic movement. But is the film really worth all the the hype? Yes, director/co-writer Ryan Coogler has more than proven his skill as a director with the dynamic Fruitvale Station and the powerhouse Rocky spinoff, Creed. The movie has a 98% rating on aggregate review site, Rotten Tomatoes. But that doesn't necessarily mean the film is as culturally impactful as people want to be. And though the first video from the soundtrack for "All Stars" with Kendrick Lamar and SZA was nothing short of majestic, there have been a few mild complaints about the music, which was curated by TDE's Kendrick Lamar and Anthony "Top Dawg" Tiffith. Some people wondered why more African artists weren't included on the soundtrack, or more artists from across the Diaspora period. Still, if you have any lingering doubts about the movie itself, set them aside. This movie is worthy of the praise its received thus far. Here are 10 reasons why. Over the past few years, there's been a cultural movement to reclaim and reaffirm the beauty of blackness, particularly in the wake of police killings, racist policy and the continued erasure of black humanity in American society, specifically. So, movies that celebrate blackness are always welcomed, and Black Panther, with its regal African setting and black king superhero had a lot of pressure on it to deliver, beyond the film world. No worries here, people. This movie is black AF. Never ever has there been a super hero movie that celebrates blackness across the Diaspora the way Black Panther does. Maybe there's never been movie period that's done so at this big budget level. It's not the gross, overbearing, or gimmicky kind of appreciation either. It's just... there. It's there in the kids playing ball on a ran down court in Oakland at the beginning of the film. It's there in the quips of the fierce warrior women who protect their home country from outside evils, and it's there in ancient traditions and homage paid to the ancestors, which is a major plot point of the film. It's there when Erik Killmonger greets T'Challa with a head nod and casual "wassup" before battle, and its there in the spirited brilliance of T'Challa's little sister, Shuri, when she teases her brother while suiting him with a futuristic suit she designed. It's overt. It's casual. It's all over the movie. Black Panther is glorious in its blackness, and it is absolutely awesome to behold. Much has been made of Michael B. Jordan in his role as the movie's primary villain, Erik Killmonger. Aside from his super obvious name (spoiler: dude kills people... often), and his chest ( which is worthy of every single yum even with his weird kill-dots), Jordan brings humanity and vulnerability to the role that is scarcely seen in big budget super hero films. Although the movie could've delved even deeper into his character (some additional backstory would've fattened his role even more), Jordan's portrayal of Killmonger, a man with single-minded ambition, stands among the best of any super hero villain ever. You cringe at his callousness while rooting for his cause. I cried for and with him, and in many ways, wondered if he was really even a "villain" at all. While he doesn't topple Heath Ledger's turn as the unhinged Joker in The Dark Knight, or Vincent D'Onofrio's calm lunacy as Kingpin in Netflix's Daredevil series— mostly because he just doesn't have enough screen time to do so— Jordan's complex portrayal of Killmonger undoubtedly anchors the movie, helping to transform it from another super hero film into a movie with a message that will resonate long after the last vibranium blast. You know how in most movies, the black character shows up to deliver a witty-one liner, or be the voice of morality to the main white character, or maybe act as a martyr for some random cause they're not really even connected to? Yeah, that doesn't happen here. The main characters are black. The side characters are black. The random characters— also black. And given the long history of black roles in big budget films, that is significant. In fact, the two white characters in the film are sidelined to roles typically fulfilled by black actors— providing comic relief and tokenism, almost. It's an interesting, subtle switch from what we're used to seeing. One of the coolest aspects of this movie that is filled with coolness, is that the women are treated like whole humans. The most dangerous warriors in the country of Wakanda— the Dora Milaje— are all women. They are the protectors of the king and ultimately the entire country. The most deadly warrior in all of Wakanda and the king's trusted advisor when things get hairy? A woman. Okoye (played by fantastically by Dana Gurira) is described at one point as the "fiercest warrior" in all of Wakanda—she plays no games with her spear. The most brilliant tech mind in Wakanda, which is also the most technologically advanced country in the entire world? A young woman. T'Challa's sister Princess Shuri designs mechanisms the rest of the world hasn't even imagined yet. The top spy in Wakanda? Also a woman. Nakia, played by Lupita Nyong'o, who is also T'Challa's ex, confidant, moral touchstone and the person who isn't afraid to give it to him straight, is an invaluable asset to the country. T'Challa may be king but it's the women who run Wakanda. Also, can we talk about black women's hair in this film? It's glorious, and real and natural. There are twists and locs, and braids and shaved heads and every variation of black hair you can imagine. And again, it's subtle but so very significant. Speaking of Princess Shuri, 24 year-old Letitia Wright is a definite scene-stealer throughout Black Panther and deserves a moment. She's brilliant, witty and has the absolute best quips in the movie. In the Marvel universe, Wakanda is the most technologically advanced country in the world—even though the world doesn't know it. The country is rich in vibranium— an exotic super element that enhances everything, and the rest of the world would literally kill for it. Too bad for the would be colonizers, Wakanda is full of brilliant minds, with exotic weapons that keep the rest of the world at bay. Wakanda's technological advances and natural resources add to the mystique and implied regality of the country and its people, and more broadly of Africans period. Yes, this is fictional but there is enough reality and deliberate references to real African civilizations to add significance to this portrayal. One of the most buzzed about aspects of the movie is the concept of Afrofuturism being incorporated into the film, and with due cause. Spaceships, an idea of what a Africa could've been like if there was no colonialism, superior technological advancements intertwined with regal African customs—it's all here in this flick. Okay, yes, this is a fictional world and Wakanda is not a real country in Africa. But the film offers a view of Africa that certainly hasn't ever been seen in a big budget super hero film. The characters are not one dimensional, and neither are the customs. Again, the presentation of black folks as whole humans is present in this film, and that's important. Coogler's writing and direction is crisp in this aspect, and also refreshing. The technology in Black Panther is super cool, and it gives the people of Wakanda a sense of superiority that lingers in every scene of the film. Their technology enables them to heal people with incredible speed, fly invisible spaceships, and possess powerful weapons the rest of the world literally can't even fathom. Their capacity for creation adds to their regality, as they almost smugly watch Americans and Europeans struggle with their slow advancements. It is also implied that because Wakanda has such vast resources, yet doesn't use them for evil or to conquer, oppress and dominate, the people are also morally superior as well. Right when you think the movie might be slightly straying into cliche super hero territory, with the long, sentimental monologue highlighting the hero's utter importance to life and whatnot, Black Panther pulls you back, sometimes with a literal reference to the corniness that's come to define films of that ilk. Black Panther is cool. There's no code-switching in this movie. It isn't riddled with raggedy stereotypes about black folks. And the layered message of the film is readily apparent, there to dissect and discuss after the credits roll. The coolness of black people that has been appropriated and commodified by non-black folks the world over is sprinkled all over this film, which gives it flavor and presence that extends beyond the Marvel Universe. This is definitely an establishing film, and it'll be interesting to see how that presence is carried over to subsequent releases.